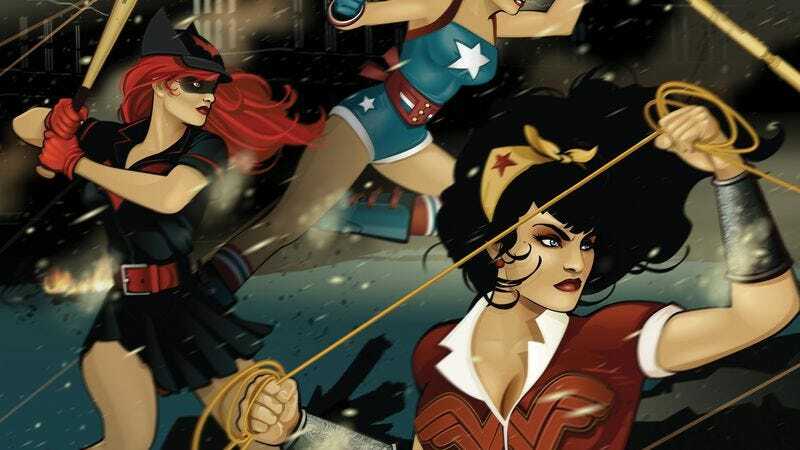 DC Bombshells has been one of the publisher’s most surprising titles of the last year, using Ant Lucia’s pinup-inspired redesigns of DC heroines as the foundation for a thrilling story about female empowerment in World War II. After operating in separate groups for the last 33 chapters of the digital-first series, these women finally come together to form a Justice League of their own in this week’s DC Bombshells Chapter 34, using their combined might to stop mystical enemies that have turned the tide of the war. These preview pages highlight the power and confidence that writer Marguerite Bennett has brought to these characters, as well as the sleek artwork from Laura Braga and Wendy Broome, who are part of a rotating art team primarily composed of female artists. Braga does exceptional work showing Lucia’s evocative designs in action, and Broome’s vibrant colors have helped give the book a lot of energy while keeping the tone on the lighter side. This book has been loads of fun, and readers that want to discover more about DC Bombshells can also pick up the first collected edition, which went on sale earlier this month. The chapter is available for download now via the DC Comics App, Readdcentertainment.com, iBooks, comiXology.com, Google Play, Kindle Store, Nook Store, and iVerse ComicsPlus.